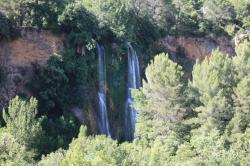 The cascade of Sillans is 44 meters height. It is formed by Bresque, a river that swells with water from the source of the Castle of St. John and the torrent of Merderie. The waterfall flows into a charming lake swirling in which, unfortunately, it is forbidden to swim. It is reached by a pleasant 800-meter walk which winds between beautiful plane trees. Info: Les Pins is located in a traditional stone building just 5-minutes' walk from the waterfall in the village of Sillans-La-Cascade. It features modern accommodation with free Wi-Fi, yet with period details. Info: Logis Auberge du Grand Chêne is located in Sillans-la-Cascade, just 1 km from the waterfalls and the centre of the fortified village. You can dine at the on-site restaurant and relax on the terrace, by the garden. Info: Located in Provence, this campsite is set on the banks of the river that has a natural swimming hole. It also offers a volley-ball court, table tennis and a library. Info: Featuring a heated swimming pool in the garden that is planted with olive trees, Mas de l'Olivette is located 18 km from Barbaroux Golf Club and 30 km from les Gorges du Verdon. You can have a continental breakfast on the south-facing terrace.